Dilated cardiomyopathy is a progressive, usually irreversible, disease causing global systolic (contractile) dysfunction with heart failure. Often, there are ventricular and supraventricular arrhythmias, conduction system abnormalities, and thromboembolism; sudden death may occur, typically in later stages of disease. From a pathologic standpoint, the term dilated cardiomyopathy is generally used to designate an idiopathic process, in the absence of long-standing hypertension, toxin exposure, or chronic alcoholism (secondary dilated cardiomyopathy). Most patients are middle aged or older at the time of onset; younger patients with dilated cardiomyopathy often have a family history and a genetic predisposition (familial dilated cardiomyopathy). Congestive heart failure with global left ventricular dysfunction, mimicking dilated cardiomyopathy, may also occur in patients with coronary ischemia and valve disease. Dilated cardiomyopathy is characterized by ventricular chamber enlargement and systolic dysfunction with normal left ventricular wall thickness (see the image below). Right ventricular dilatation and dysfunction may be present but are not necessary for the diagnosis. Gross heart specimen from a patient with dilated cardiomyopathy who died in end-stage heart failure. Defibrillator leads are in the right heart. The ventricles are dilated with normal ventricular wall thicknesses, imparting an appearance of thin ventricular walls. The ventricles are dilated more than the atria. 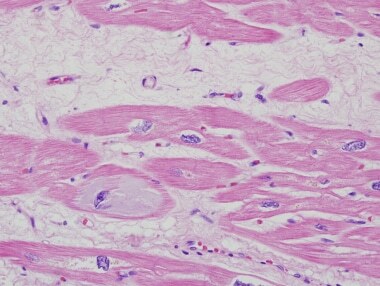 Dilated cardiomyopathy is a diffuse process, and cardiomyocytes of both ventricles (see the image below) are involved; atrial function is also decreased. A primary heart muscle disease, dilated cardiomyopathy has no clear cause. Heart transplantation is the treatment of choice. Heart section from a cardiac explant in a patient with end-stage cardiomyopathy. 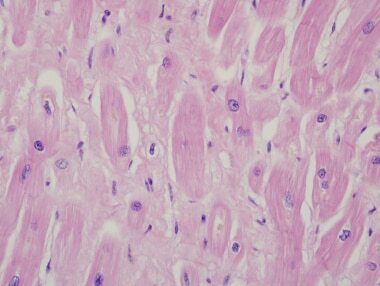 Note the cardiomyocyte multinucleation. The change is nonspecific and can be seen in heart failure from any cause. Dilated cardiomyopathy can be classified by cause as familial, primary without family history, or secondary (associated with or caused by other conditions). Approximately 2 of 3 patients have no known family history (sporadic dilated cardiomyopathy). About 15% of sporadic cases arise from chronic myocarditis, leading to scarring and heart failure. Viruses that cause myocarditis include coxsackievirus, adenovirus, parvovirus, and human immunodeficiency virus (HIV). Dilated cardiomyopathy may manifest clinically at a wide range of ages, but this condition most commonly occurs in the third or fourth decade of life. Dilated cardiomyopathy is associated with a survival rate of less than 50% at 10 years. With better supportive care, however, improved 5- and 10-year survival rates have been reported. Peripartum cardiomyopathy may be reversible in up to 50% of patients but often recurs with subsequent pregnancy. There is a negative association in dilated cardiomyopathy between survival and frequent ventricular tachyarrhythmias that require antiarrhythmic treatment or automated implantable cardioverter-defibrillator (AICD) placement. Dilated cardiomyopathy is characterized by the presence of an increased left ventricular diastolic dimension and a decreased shortening fraction, usually less than 25%. Note that postmortem ventricular measurements might underestimate the diameter measurement, as precise end-diastolic measurements are impossible. Dilated cardiomyopathy is usually identified when limiting symptoms are severe, but arrhythmias or sudden death are uncommonly early manifestations. In family echocardiographic screening studies, asymptomatic or mildly symptomatic relatives may be identified. In contrast to arrhythmogenic and hypertrophic cardiomyopathy, arrhythmias in dilated cardiomyopathy are typically prominent only after the onset of significant heart failure. The clinical and pathologic differential diagnosis of dilated cardiomyopathy is meant to exclude secondary causes of heart failure. Pathologically, the histologic features are nonspecific (see Microscopic Findings). Grossly, enlarged, dilated hearts can be seen in long-standing hypertensive heart disease, and valve disease and severe coronary disease should be excluded. At endomyocardial biopsy, amyloid, iron deposition, and significant inflammation should be excluded by routine staining supplemented by special stains. In addition, the clinical history that excludes other causes of heart failure should be elicited before a specific diagnosis of dilated cardiomyopathy is made. The distinction between cardiomyopathy resulting from coronary artery disease (ischemic cardiomyopathy) and primary dilated cardiomyopathy can be problematic. Some authors have suggested that the diagnosis of ischemic cardiomyopathy be made if coronary artery disease and concomitant global left ventricular dysfunction that is out of proportion to the coronary obstruction exists (for example, if an ejection fraction of less than 40% with narrowing of 50% or less in a proximal artery or more than 50% narrowing of a distal artery is found). This definition of ischemic cardiomyopathy has been shown to be ineffective. The term ischemic cardiomyopathy is now generally reserved for patients with severe coronary disease and global left ventricular dysfunction, typically with a healed transmural infarct. 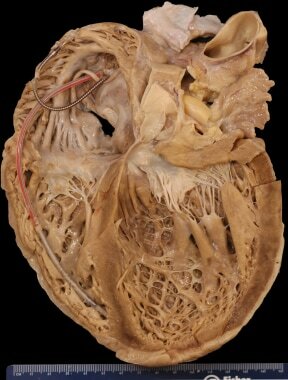 The hallmark gross finding at autopsy is left ventricular dilatation, usually more than 4 cm. Cardiomegaly is usually considered a requisite for the diagnosis of dilated cardiomyopathy. The mean heart weight is about 600 g.  Some patients with dilated cardiomyopathy have very little cardiac enlargement, and the diagnosis must be made on clinical grounds. Typically, 4-chamber dilatation that is greater in the ventricles than the atria is found. In patients with a history of atrial fibrillation, atrial dilatation may be prominent. At autopsy, measuring the chamber cavity at the level of the papillary muscles in a transverse cut best assesses left ventricular dilatation. Concomitant right ventricular dilatation results in the typical globular appearance of the heart. Mural thrombi are common in patients who do not receive anticoagulation. 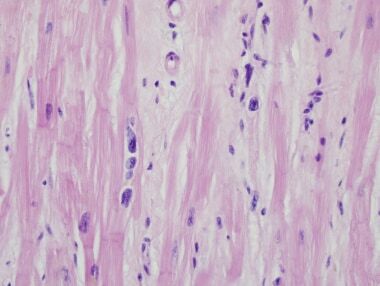 Ventricular endocardial fibrous plaques, presumably a sequela of thrombi, occur in about 10% of cases. Mild diffuse or patchy endocardial fibrosis, especially toward the ventricular outflow tracts, is frequent and is likely a result of cardiac dilatation. 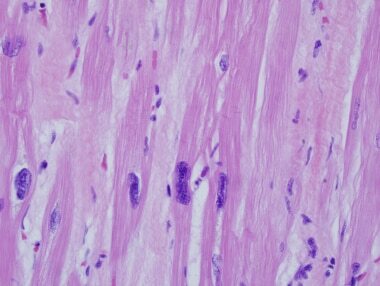 The histologic features of dilated cardiomyopathy are nonspecific; therefore, it is a microscopic diagnosis of exclusion. In biopsies, the findings range from minimal variation in myocyte size to typical features of myofiber loss, interstitial fibrosis (see the image below), and marked variation in myofiber size. The important features are negative findings, such as the lack of inflammation, amyloid, iron, and granulomas. The role of endomyocardial biopsy in the diagnosis of dilated cardiomyopathy is primarily to exclude secondary causes. Endomyocardial biopsy may establish a specific diagnosis in approximately 25% of patients; these have primarily been patients with amyloidosis, hemochromatosis, and Adriamycin toxicity. Heart section from a cardiac explant in a patient with end-stage cardiomyopathy. There is focal interstitial fibrosis. The change is nonspecific and can be seen in heart failure from any cause. Heart section from a cardiac explant in a patient with end-stage cardiomyopathy. Note the variation in nuclear size. The change is nonspecific and can be seen in heart failure from any cause. Ultrastructurally,  hypertrophied, as well as atrophied, myocytes exist, the volume density of myofibrils is reduced, and mitochondrial density is normal, but the mitochondria are more numerous and small. An image of a heart section in a patient who had end-stage cardiomyopathy is depicted below. Heart section from a cardiac explant in a patient with end-stage cardiomyopathy. Note the intracellular accumulation of amorphous material (basophilic degeneration). The change is nonspecific and can be seen in heart failure from any cause. The X-linked gene responsible for Emery-Dreifuss muscular dystrophy, emerin (another nuclear lamin protein), may also cause dilated cardiomyopathy. Other X-linked diseases associated with dilated cardiomyopathy include muscular dystrophies (eg, Becker and Duchenne); these patients are more likely to have elevated serum creatine kinase levels. Dilated cardiomyopathy may also occur in patients with mitochondrial myopathies and inherited metabolic disorders (eg, hemochromatosis). Sarcomeric proteins are increasingly being identified in familial dilated cardiomyopathy. These include alpha-cardiac actin; alpha-tropomyosin; cardiac troponin T, I, and C; beta- and alpha-myosin heavy chain; myosin binding protein C; muscle LIM protein; alpha-actinin-2; ZASP, and titin. In some families with sarcomeric mutations, hypertrophic and dilated phenotypes overlap, highlighting the plasticity of these genes and occasional genotypic-phenotypic discordance. These findings also underline the importance of defining cardiomyopathy by morphologic, and not genetic, features. Maron BJ, Towbin JA, Thiene G, Antzelevitch C, Corrado D, Arnett D, et al. Contemporary definitions and classification of the cardiomyopathies: an American Heart Association Scientific Statement from the Council on Clinical Cardiology, Heart Failure and Transplantation Committee; Quality of Care and Outcomes Research and Functional Genomics and Translational Biology Interdisciplinary Working Groups; and Council on Epidemiology and Prevention. Circulation. 2006 Apr 11. 113(14):1807-16. [Medline]. Elliott P, Andersson B, Arbustini E, Bilinska Z, Cecchi F, Charron P, et al. Classification of the cardiomyopathies: a position statement from the European Society Of Cardiology Working Group on Myocardial and Pericardial Diseases. Eur Heart J. 2008 Jan. 29(2):270-6. [Medline]. Skrzynia C, Berg JS, Willis MS, Jensen BC. Genetics and heart failure: a concise guide for the clinician. Curr Cardiol Rev. 2015. 11 (1):10-7. [Medline]. Rakar S, Sinagra G, Di Lenarda A, Poletti A, Bussani R, Silvestri F, et al. Epidemiology of dilated cardiomyopathy. A prospective post-mortem study of 5252 necropsies. The Heart Muscle Disease Study Group. Eur Heart J. 1997 Jan. 18(1):117-23. [Medline]. Matsumura Y, Takata J, Kitaoka H, Kubo T, Baba Y, Hoshikawa E, et al. Long-term prognosis of dilated cardiomyopathy revisited: an improvement in survival over the past 20 years. Circ J. 2006 Apr. 70(4):376-83. [Medline]. Keren A, Billingham ME, Weintraub D, Stinson EB, Popp RL. Mildly dilated congestive cardiomyopathy. Circulation. 1985 Aug. 72(2):302-9. [Medline]. Boffa GM, Tarantini G, Abbasciano A, Razzolini R, Chioin R, Thiene G. Ischemic cardiomyopathy: lack of clinical applicability of the WHO/ISFC classification of cardiomyopathies. Ital Heart J. 2001 Oct. 2(10):778-81. [Medline]. Roberts WC, Ferrans VJ. Pathologic anatomy of the cardiomyopathies. Idiopathic dilated and hypertrophic types, infiltrative types, and endomyocardial disease with and without eosinophilia. Hum Pathol. 1975 May. 6(3):287-342. [Medline]. Roberts WC, Siegel RJ, McManus BM. Idiopathic dilated cardiomyopathy: analysis of 152 necropsy patients. Am J Cardiol. 1987 Dec 1. 60(16):1340-55. [Medline]. Zhang M, Tavora F, Huebner T, Heath J, Burke A. Allograft pathology in patients transplanted for idiopathic dilated cardiomyopathy. Am J Surg Pathol. 2012 Mar. 36(3):389-95. [Medline]. Edwards WD. Cardiomyopathies. Hum Pathol. 1987 Jun. 18(6):625-35. [Medline]. Petrovic D, Zorc M, Zorc-Pleskovic R, Vraspir-Porenta O. Morphometrical and stereological analysis of myocardial mast cells in myocarditis and dilated cardiomyopathy. Folia Biol (Praha). 1999. 45(2):63-6. [Medline]. Li LX, Nohara R, Okuda K, Hosokawa R, Hata T, Tanaka M, et al. Comparative study of 201Tl-scintigraphic image and myocardial pathologic findings in patients with dilated cardiomyopathy. Ann Nucl Med. 1996 Aug. 10(3):307-14. [Medline]. Gunja-Smith Z, Morales AR, Romanelli R, Woessner JF Jr. Remodeling of human myocardial collagen in idiopathic dilated cardiomyopathy. Role of metalloproteinases and pyridinoline cross-links. Am J Pathol. 1996 May. 148(5):1639-48. [Medline]. [Full Text]. Kostin S, Hein S, Arnon E, Scholz D, Schaper J. The cytoskeleton and related proteins in the human failing heart. Heart Fail Rev. 2000 Oct. 5(3):271-80. [Medline]. Chen X, Zhang Y. Myocardial Cx43 expression in the cases of sudden death due to dilated cardiomyopathy. Forensic Sci Int. 2006 Oct 16. 162(1-3):170-3. [Medline]. Olivetti G, Abbi R, Quaini F, Kajstura J, Cheng W, Nitahara JA, et al. Apoptosis in the failing human heart. N Engl J Med. 1997 Apr 17. 336(16):1131-41. [Medline]. Zorc M, Vraspir-Porenta O, Zorc-Pleskovic R, Radovanovic N, Petrovic D. Apoptosis of myocytes and proliferation markers as prognostic factors in end-stage dilated cardiomyopathy. Cardiovasc Pathol. 2003 Jan-Feb. 12(1):36-9. [Medline]. Verga L, Concardi M, Pilotto A, Bellini O, Pasotti M, Repetto A, et al. Loss of lamin A/C expression revealed by immuno-electron microscopy in dilated cardiomyopathy with atrioventricular block caused by LMNA gene defects. Virchows Arch. 2003 Nov. 443(5):664-71. [Medline]. Arbustini E, Diegoli M, Morbini P, Dal Bello B, Banchieri N, Pilotto A, et al. Prevalence and characteristics of dystrophin defects in adult male patients with dilated cardiomyopathy. J Am Coll Cardiol. 2000 Jun. 35(7):1760-8. [Medline]. Moriuchi T, Muraoka T, Mio K, Osumi T, Hirose F. Long-term expression of the lamin A mutant associated with dilated cardiomyopathy induces senescence. Genes Cells. 2014 Dec. 19 (12):901-18. [Medline].